Starring: Macon Blair, Devin Ratray, Amy Hargreaves, Kevin Kolack, Eve Plumb, Brent Werzner, David W. Thompson, Stacy Rock, Bonnie Johnson, Sidné Anderson. Many didn’t pay attention when Jeremy Saulnier made his directorial debut in 2007 with the little seen comedy/horror film “Monster Party“. I know I didn’t. 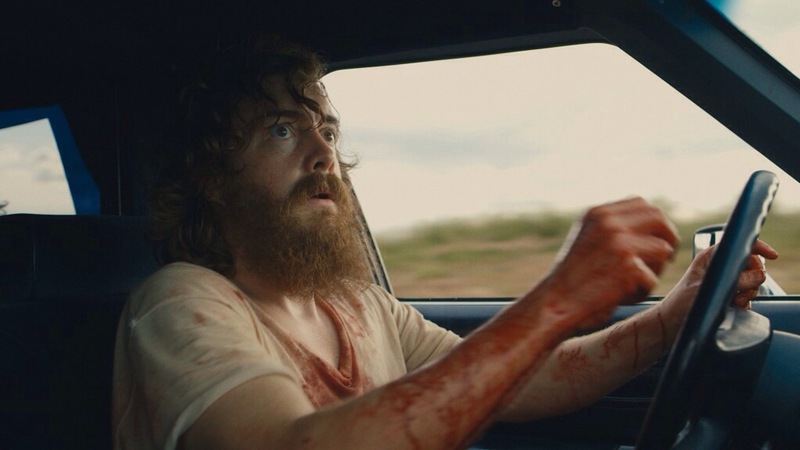 Now, though, it’s going to be hard to forget him as his sophomore effort “Blue Ruin” hits our screens (and our jugulars) with an impressively handled and assembled dark thriller that brings reminders of the arrival of the Coen brothers and all the taut and twisted glee of “Blood Simple“. Dwight Evans (Macon Blair) is a man seemingly down on his luck but his self-imposed exile from society is the result of his parents being murdered at the hands of a powerful criminal family. When he discovers that the man convicted of his parents’ murders has been released from prison, he sets out to even the score with a revenge killing. 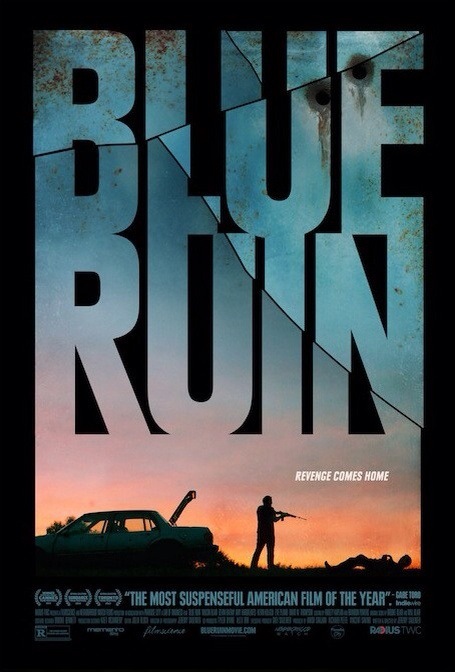 The first thing that strikes you about “Blue Ruin” is it’s odd choice of a leading actor. 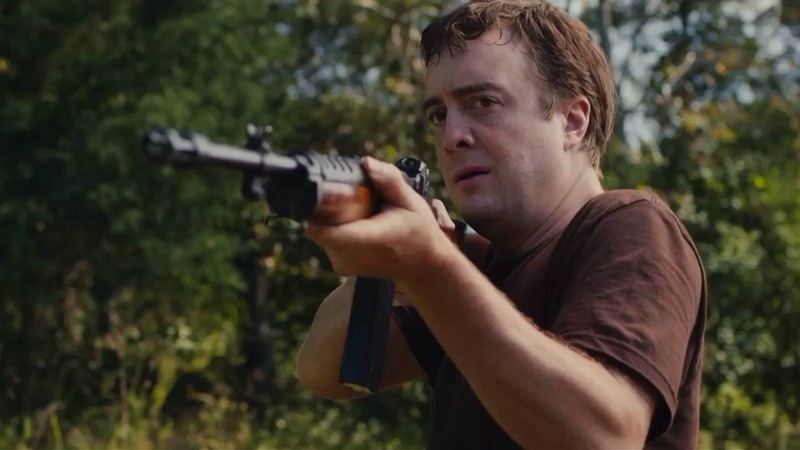 Relative unknown Macon Blair doesn’t have the chiseled looks or the physique of a man on a revenge mission. There’s a vulnerability to him and from the outset we are introduced to him as nothing more than a hobo who eats from garbage bins and hides under a mane of greasy hair and a long unkempt beard. Blair, however, doesn’t use his hirsuteness to mask his performance. Once he actually grooms himself, he reveals an even more vulnerable side with gentle eyes that speak volumes. He’s a flawed everyman that’s easy to relate to and identify with and Blair’s outstanding central performance is pitched to the perfect level. He lends an authenticity to an already believable and cleverly structured modern noir. Writer/director/cinematographer Saulnier’s approach the material couldn’t be more deftly handled either. He doesn’t rely on an intrusive music score or shock tactics (as you’d maybe expect from a director who cut his teeth on a low-budget horror movie) but wisely pairs events down and allows the tension and suspense to build assuredly around natural characters, performances and events. He’s also not adverse to interspersing the proceedings with some welcome dark humour. This is an absolutely solid piece of work that commands your attention from the opening scene and even though it has a quiet, reflective tone to it, it sustains it’s vice-like grip and refuses to let go. On this evidence, it looks like we’ve witnessed the arrival of two very special talents. 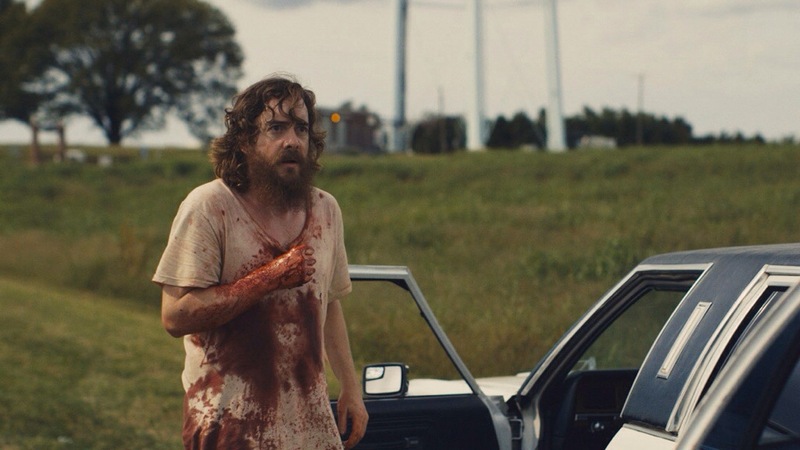 Both Jeremy Saulnier and Macon Blair are definitely for the watching and they’ve delivered one of the best (and biggest) surprises of the year. This is raw, visceral and unbearably tense filmmaking. This entry was posted on June 6, 2014 at 3:20 pm and is filed under Crime, Film-Noir, thriller with tags 2014. You can follow any responses to this entry through the RSS 2.0 feed. You can leave a response, or trackback from your own site. Definitely on my must-see list, Mark! It’s a fabulous film, Michael. Knowing your tastes a little, I reckon you’ll take plenty from this. I just saw this last week and I loved it. I loved how he took the tropes of your standard revenge thriller, but made his protagonist a perfectly ordinary person, scared of – and not very good at – violence and pulled into a situation he clearly didn’t want to be in. also, it was shot beautifully. A great little movie. Couldn’t agree more, Cathy! It was the ordinariness of the main character that allowed you to completely identify with him. Macon Blair played the role perfectly and it held my attention to the very end. Wonderful little film. In total agreement with you here mate. I enjoyed this a lot, it keeps up a good level of tension and the opening 20/30 mins or so in particular is superb. I’ll definitely be keeping my eye out for more from Saulnier and Blair on this showing. Great flick, Stu! Like you mention, when it opens, it refuses to let up and entirely hooks you. I thought after that that the film would struggle when it slowed down but it didn’t. It became a solid drama as well. Yeah it really gambled when it slowed down by relying on the one main character, didn’t it? He was fascinating and it totally worked for me though. Brave as well to make a film that’s almost wordless for the first fifteen minutes or so, but I was hooked by it. D’you know? I didn’t even give the lack of dialogue in the beginning a second thought. It never occurred to me until you’ve just said it. You’re spot on. That just shows you how intense it is. The lack of dialogue isn’t even an issue. Unless we’re including Inside Llewyn Davis on the 2014 list, this one is probably my film of the year thus far. It’s fraught with solemnly bubbling tension. An adept piece of work for someone so inexperienced. Excellent review too mate! I included Inside Llewyn Davis in last years flicks, mate. In fact, it was my second favourite film of the year after Spike Jonze’s “Her”. So if we’re playing by my rules 😉 then this is your favourite thus far. I wouldn’t argue with that, though. I’ve only gave out a 4.5 rating twice this year and this one of them. Nice one, Muckers!! Solid movie!! Great review, Mark! You’ve piqued my interest! Thanks Fernando. You should definitely check it out. It’s brilliant film. Glad to see this movie is still making the rounds, I really loved it and got the chance to talk to both the director and the star and they couldn’t be two nicer guys. Aah! Nice one Bubba. This was a great movie and I doubt it’ll be the last we see of Saulnier and Blair. Both deliver towering work here. Can’t wait to see what they come up with next. Good review Mark. It doesn’t do much different in terms of other revenge-thrillers, but it does enough good to where it’s enthralling just about the whole time. Cheers Dan. This just didn’t let up from the opening scene. Even though it slowed down a little after the first half hour, it still sustained it’s grip. I loved it. Top marks Mark (sorry). I’m pretty sure this’ll be in my Top 10 of the year come Dec 31. Revenge movies don’t come any better. Totally agree Mark. There’s a damn good chance this’ll make my top 10 too. If it doesn’t, it’s got to be one hell of a year for films to top this. Nice to read another positive review of this! It’s definitely on my short list of favorites so far this year, and I loved how it was anything but a conventional revenge flick. Definitely a favourite of mine so far, Eric. There’s only this and “Enemy” that I’ve given a 4.5 rating this year. Good to hear you think highly of it too. Great review Mark! This was actually playing at a local film fest but it just seemed too intense for my feeble nerves. Glad to hear it was great though. Thanks Ruth. This is a fabulous film. There’s a bit of violence in the opening but after that it’s mainly just tension. I’d give it a shot if you get another chance. As always, fantastic review Mark! I keep reading brilliant things about this movie, I really want to see it! Thanks Zoe. If you get the chance, grab it! Such a well made little flick. A great looking and sounding film that probably won’t end the way everyone expects. It’s a fabulous film, Jack. I can’t praise it enough. Well worth a watch. Great stuff mate. Keep seeing really positive reviews of this so I’m intrigued to check it out. Looks like it might be one of the sleeper hits of the year by the sounds of things. Definitely the sleeper hit of the year, Chris (well, so far anyway). Great little flick and well worth seeking out, man. Nice! So happy that you liked this one. I’ve been trying to get as many people as possible to see this for months, and I just love reading additional praise for it. I agree, Saulnier and Blair are two of the best surprises of the year. Such fine and confident work here. Interesting. I had left watching this film out for some odd reason. Gotta look for it on VOD again. Great review. Encompasses almost everything you need to know to get that film and watch it. Thanks Ankit. It’s definitely worth a look, if only to witness one of American cinema’s most revered films from the 70’s. Personally, I don’t think it can compete with the best of that decade but it’s still a good flick. Wow with every review that comes in I’m getting more and more tense myself, waiting to get to this! In the meantime, I managed to get tickets to something I think could very well be similar in tone and perhaps even in how it’s story develops: it’s another suspenseful little thing called Night Moves, with Jesse Eisenberg. Just put the review up a day or two ago if you wanna go take a look at that. It’s a tight, tight little film, Tom. It’s such a wee treat, man. I’m sure you’ll be another to sing it’s praises when you see it. Ah yes, the World Cup would certainly do it. You pulling for anyone in particular? How about them Spaniards, eh??!! Wow. . . .
I’m enjoying watching Chile, though. They’ve got a great structure to them and I always support the underdogs. Hahaha. To be honest Mark I didn’t even know Scotland made into group play!! hahah. Which grouping are they in?? Nice review Mark. Agree this is a fine revenge thriller and I’m looking forward to seeing where Jeremy Saulnier takes us next. 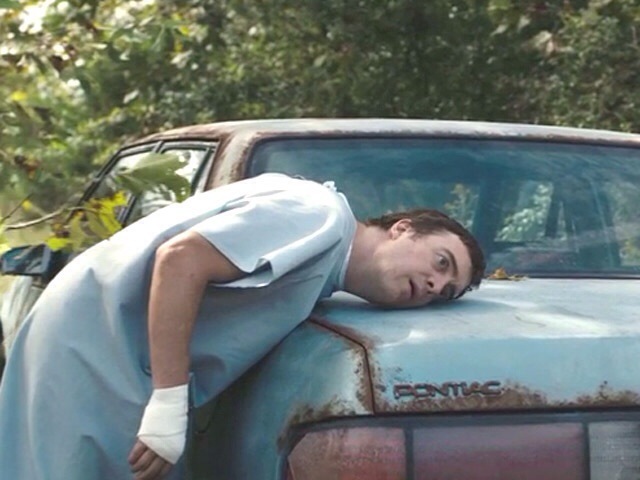 Loved the performance from Macon Blair – his sweetness and vulnerability gave the film real depth. Was pretty taken with Devin Ratray as Ben too – great chemistry between those two. I totally agree. Both Blair and Saulnier have really made names for themselves here. Whatever they do next, I’ll definitely be checking them out.